Robert died from wounds received in action near Tilloy, Arras, on the 23rd May 1917. He was 32 years old and unmarried. Robert Vaughan was born in Rhuddlan on 13th February 1885. He was the only son of the Revd. Thomas Walter Vaughan, Vicar of Rhuddlan and Rural Dean of St. Asaph and his wife Annie. According to the 1891 Census, the Family lived at the Vicarage and Robert had two older sisters. The census also recorded that whilst the parents spoke both Welsh & English, the children were monoglot English. Subsequently he attended Liverpool University before moving to University College London Medical School in 1904. He obtained diplomas of M.R.C.S and L.R.C.P Lond.1908 and graduated M.B., and B.S. Lond., in 1910. Following graduation he was appointed House Surgeon at Cardiff Infirmary, his appointment being reported in the Denbighshire Free Press 13th February 1909 [newspapers.library.wales]. Sometime before 1911, he was appointed Assistant Medical Officer at Banstead Asylum, Surrey, where he remained until the outbreak of war. [Great War Forum; quoting sources:- Rossall School Register & UCL Record of UCL Medical School who died on service 1914-1919] At the time of the 1911 Census, Robert is recorded as Assistant Medical Officer at Banstead. Dr Vaughan is commemorated on the Banstead Hospital Memorial to Staff & Patients who died in WW1. The memorial is currently housed in the reception area at H.M.P. High Down. As a staff member, he is also commemorated on the London County Council Roll of Service. The centenary of his death will be commemorated at All Saints Church, Banstead on 23rd. May 2017. On the outbreak of war Robert enlisted in the Royal Army Medical Corps. The London Gazette 8th September 1914, confirms he was granted the rank of Temporary Lieutenant. The supplement to the Gazette dated 14th January 1915, reports that he relinquished his Commission on 31st December 1914, apparently soon after his arrival in France [Great War Forum]. He then saw service with the “Urgent Cases Hospital” run by civilian volunteers under the auspices of the “British Union of Trained Nurses”. The Union had made an offer to the French Government to raise a complete medical unit to assist the French medical services. Recruitment commenced in January 1915, and the unit arrived in France that March. It was originally located in Bar-le-Duc, near Verdun. In September 1915 the unit re-located to Revigny, and was based in the Château Le Faux Miroir. The Urgent Cases Hospital was the only British unit on the Meuse. It came under the Regulation of the French Army, and treated some 3000 wounded French soldiers during the battle of Verdun. Officers could, with the permission of their Commanding Officer, resign their commission [Great War Forum]. In Robert’s case, his resignation was possibly allowed, as it would have been politically expedient to be offering assistance to the French. “On the retirement of the Expedition [following the fall of Belgrade 8/9th October 1915 to Austro-Hungarian forces], he continued to work with Serbian Refugees at Monastir, subsequently retreating to Florina on the advance of the Bulgarians, and then finally in Salonika. The British Vice-Consul in Monastir wrote very highly of his self-sacrificing devotion to duty” [Du Ruvigny’s Roll of Honour]. According to the Red Cross records, Roberts’s service ended in July 1916, when he is recorded as “killed in action”. This was clearly an incorrect entry, as shortly after his return to the United Kingdom, Robert enlisted in the Royal Field Artillery as a Gunner. Why, is currently a mystery, though his obituary in the Denbighshire Free Press of 2nd June 1917 [newspapers.library.wales] spoke of; “his zeal carrying him forward to a more active participation in the war, and he joined the fighting forces”. The same obituary also reported that; “he was in charge of the guns, with his battery of the RFA when he was killed”. This statement is puzzling, since available records show that he was serving as a Gunner with the Divisional Ammunition Column, which kept the guns supplied with ammunition. Given his stated rank and unit, it would be unlikely that he would be in charge any guns unless the exigencies of the situation demanded it. The Rhyl Journal’s report of 2nd June 1916 states, that he was offered a Commission in the RFA but declined, fearing that acceptance might delay his deployment to the front. News of her son’s death must have come as a great blow to his Mother, as her husband Revd. 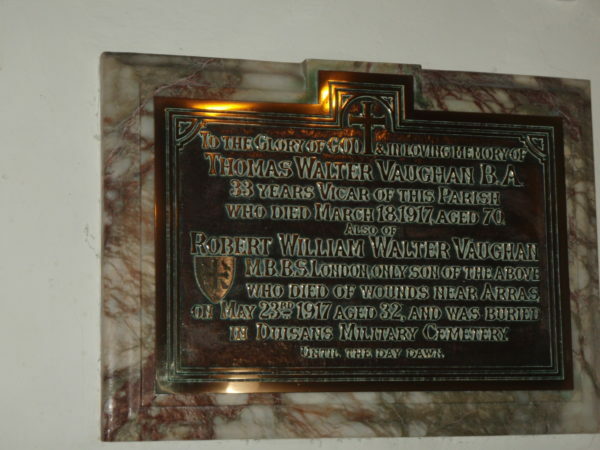 Vaughan, had died suddenly on March 18th 1917. There is a brass plaque inside St Mary’s Church commemorating Robert & his Father, which was donated by his Mother. On the 24th August 1918 Administration was granted [Probate Records Ancestry] to his Mother in respect of his effects, value £276-3s-6d. By this time she had moved to Rhyl. By coincidence, Robert died on the same day as Joseph Jones, who is also commemorated on Rhuddlan’s War Memorial. Robert’s death was reported in various publications, including The Times, The Telegraph and The British Medical Journal. In addition to the Brass Plaque in the Church and the memorials already mentioned, Robert is also remembered on St. Mary’s Church Scroll of Honour and Memorial Stained Window, the Royal British Legion’s Roll of Honour [inside the Community Centre] and the North Wales Memorial Arch at Bangor. In addition he is commemorated on the family headstone in St Mary’s Churchyard. I am indebted to Sarah Hodnett of Rhuddlan Local History Society and James Crouch of Banstead, for their assistance in compiling this record.